November and December are busy months for gardeners. If you’ve sown flower and vegetable seeds, this is the time when you probably go out first thing in the morning, huddled against the nip in the air, to check out how much things have progressed overnight. I do. Any pragmatist would say, it’s a little futile to get so excited since plants don’t grow all that much overnight. But, I guess, when you garden with your heart and not your head, you make that morning recce even before the morning cuppa arrives. Space: If you have less space, you could pick up fewer varieties or fewer of each specimen. I normally pick up just one dozen of each specimen. Nasturtium seeds can still be planted. Not every nursery sells the seedlings since they are pretty easy to grow anyway. Nasturtiums aren’t fussy about the health of the soil and reward you with their typical leaves and bright, fragrant orange and yellow flowers. They are also great on the table, but we’ll talk about edible winter flowers another day. Keeping nasturtiums company could be dianthus or phlox, sunny calendula and the photosensitive ice plant. Location: Are you gardening on the ground or on a balcony, which translates to container gardening? Plants that require deep soil, specially root vegetables, may be out for apartments, unless you make special provision for the roots to develop in deep tubs. Pansies are among the flowers that do well in container gardens and don’t require too much care. Their dual colours bring in a warm yellow glow with the purple. Petunias are getting more and more vibrant in colour, size and form. Sun: Will your plant receive four-six hours of sun in winter? If not, don’t worry. Not all winter flowers seem to love the sun. Cineraria is a plant that loves a shady garden. It is easy to grow and rewards your faith with vibrant jade-green leaves and a shock of flowers that range from shades of purple, blue, pink and even a delightful orange and white. In fact, flowers from the same bunch can be very different in colour. You could pick up some Australian primulas that perfectly complement the cineraria. Temporary containers: Those of us who have small balconies but cannot resist planting winter flowers can try the temporary container option. Wooden fruit boxes, easily available with most fruit sellers make great planters when they are lined with plastic. Snip a few tiny openings in the plastic for the air to circulate and the water to drain off, and your winter planter is ready. Verbena is a common favourite. Plant tumblers and shorter growers including nasturtiums and ice plants along the border to break the monotony of wood. 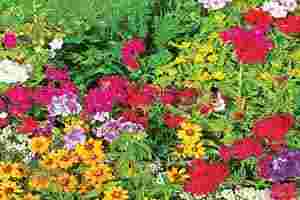 The hardy sweet alyssum with its pink, white and purple flowers, is a good choice. Bulbs such as gladioli will love these beds. So would the delphinium. However, do remember that all parts of the delphinium are poisonous, so you may wish to give this plant a miss if you have young children and pets. Other winter flowers believed to be poisonous include the Christmas flower or poinsettia and the verbena. This is also the time that some of us despair over the gorgeous monsoon leaves of ornamentals turning yellow. These plants remind you of the cycle of life. It’s great to keep them close to the mother plant rather than sweep them away. Leaves can be composted or dried for a couple of days and then placed on top of the soil as mulch. Gardening is about celebrating life even if it reminds you of that great truism: dust to dust.